GOODBYE STRANGER by Rebecca Stead is “a captivating new novel about the bonds – and limits – of friendship” by a Newbery Medal winning author. It will be published by Penguin Random House in August. THE NEST written by Kenneth Oppel and illustrated by Jon Klassen is the story of a young boy who wants to save his sickly baby brother and thinks he may have found the answer when a wasp comes to him in a dream. Simon & Schuster will publish this in October. 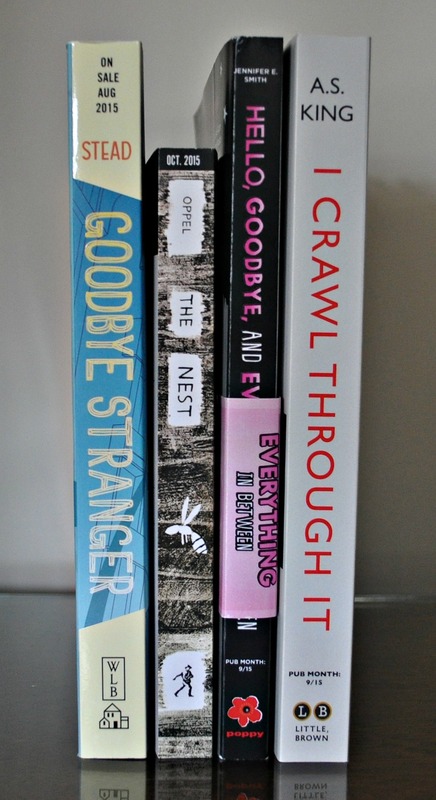 HELLO, GOODBYE, AND EVERYTHING IN BETWEEN by Jennifer E. Smith tells the story of a young couple who are trying to decide if they should stay together as they head off to college. “It explores the difficult choices that must be made when life and love lead in different directions.” It will be published by Hachette in September. BEING MORTAL by Atul Gawande has been described as life changing. Gawande is a surgeon and he writes about medicine’s “ultimate limitations and failures . . . as life draws to a close.” Henry Holt published this book in 2014. SAINT MAZIE by Jami Attenberg is the story of a movie theater owner who opens its doors to those in need during the Depression. Much of the book is told in diary format. Hachette published this in June. THE ART OF MEMOIR by Mary Karr tells about Karr’s experiences writing her memoir and teaching the craft. It will be published by Harper Collins in September. THE SHORT AND TRAGIC LIFE OF ROBERT PEACE by Jeff Hobbs is the story of a young man from the ghetto whose mother was determined to get him out of it. He earned a degree from Yale University yet could never fully escape the streets. Hobbs was his college roommate and is sure to tell his story with compassion. Scribner published this one in 2014. A WINDOW OPENS by Elisabeth Egan is the story of Alice, a woman who lands a job with a company that “promises to revolutionize the twenty-first century reading experience.” Of course, there are complications. Coming out in August, this book will be published by Simon & Schuster. ORPHAN NUMBER EIGHT by Kim van Alkemade was inspired by a true story. It’s the story of a young girl who is sent to an orphanage when she’s four. They conduct cruel medical experiments on her that leave her disfigured. Years later, she finds herself caring for the doctor who conducted the experiments. Harper Collins will publish this in July. EVERYBODY RISE by Stephanie Clifford is the story of an outsider who aspires to a higher social standing. St. Martin’s Press will publish this book in August. THE READERS OF BROKEN WHEEL RECOMMEND by Katarina Bivald tells the story of a young Swedish woman who travels to Iowa to meet her pen pal only to discover she’s just passed away. Since they often wrote about books, she decides to open a bookstore to honor her friend. This will be published by Sourcebooks in January of 2016. EARLY ONE MORNING by Virginia Baily is the story of an Italian woman fleeing the Nazis in Rome. When she sees a young mother and her son being loaded onto a truck she claims the boy as her own. Hachette will publish this in September. 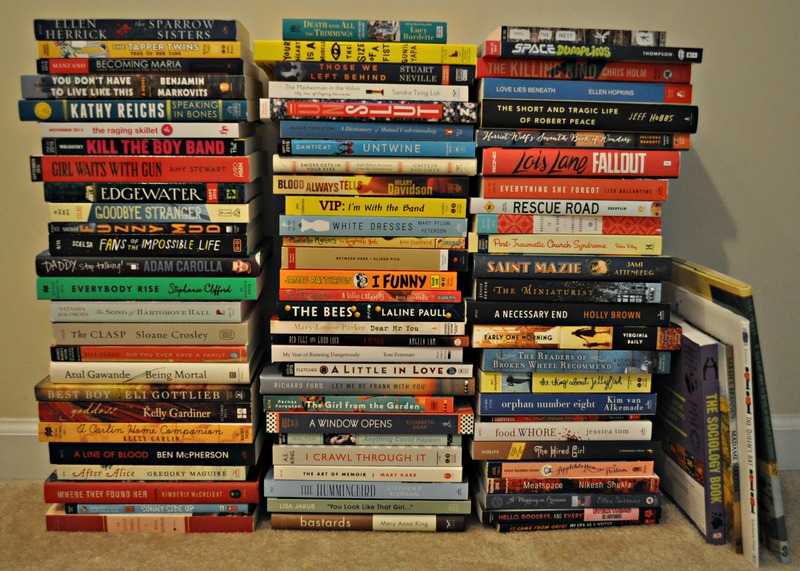 Since I like to look at photos of the books others get at BEA, I decided to include this photo of all of my books. (Click on the photo to enlarge it.) 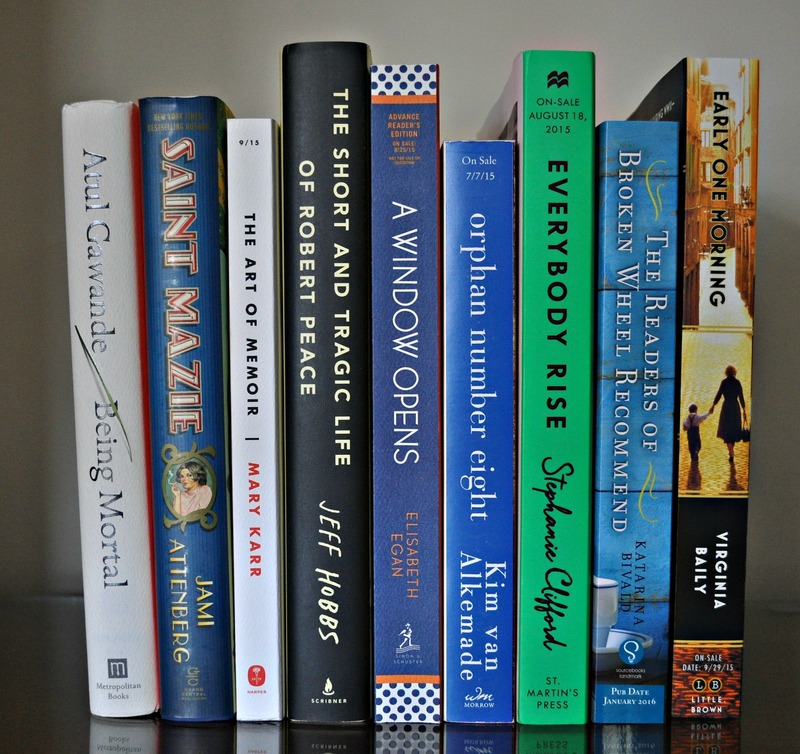 What upcoming books are you excited about? Thanks for sharing your books Kathy. They all look wonderful! I browsed the 2015 Fall/Winter Buzz Books a few days ago and was excited to see the new Trigiani book. Unlike most books in the issue, it was not available for request. Hoping it will be soon! A friend recently read Orphan Number Eight and recommends it. I look forward to your reviews on all of these. Did you have these shipped home??? WOW – Orphan # 8 appeals to me. Wow, all the books!!!! Being Mortal is an excellent, though difficult read… not a subject most of us really want to think about. So many others there I’d like to read, too. Wow, I LOVE that stack!! I cannot stop ogling, lol! There are several books in your stack that I need to read as well – Being Mortal, A Window Opens, The Readers of Broken Wheel Recommend. I like the selective bit! I’ve read Orphan No 8. Very moving. I can’t believe you got all those! Didn’t you say you only had one box? Wow, impressive packing skills! A Window Opens sounds interesting…I hadn’t heard of that one! I picked up Everybody Rise as well. And I’m interested the Robert Peace book! They look so good! Love the YA selections. You were really selective! I love looking at book stacks, too! Almost all of the titles were new to me. My sister is reading Being Mortal and recommends it. We are both at that age that we are thinking about end of life decisions. I haven’t acquired it yet. The Readers of Broken Wheel caught my eye. I got most of these too! The Short and Tragic Life of Robert Peace and Being Mortal were two of the most compelling books I read last year. I can’t wait to read Everybody Rise. Some there I missed! Must look them up. Wow! So many good books! I’ve gotten a few through NetGalley, which I’m eager to read. Have to admit that I am jealous of your copy of Orphan Number 8. Enjoy all your new reads!! Lucky you! Enjoy…and I am especially drawn to A Window Opens. Thanks for sharing. I especially like the books you pulled out, though in the stack I see others I’d like to know more about. You’re going to be in good shape with great books to read! Excited about many, I’m already on the list at the library for the new Rebecca Stead book! And I spy Lois Lane in your pile–looks great too! Wow, that’s a ton of books Kathy! I hope you get to read all of those. A lot of them look great! You hit the jackpot! I hope you enjoy every one of them, and can’t wait for your reviews. Thanks for sharing your book haul! I definitely would have stood in line for the new A.S. King. So many intriguing titles! What a great collection of books you have to read, Kathy! I hope you enjoy them all. That’s a lot of books!!!! I will vouch for you — you were kind of selective. LOL! Wow! a lot of reading ahead. Thanks for this awesome sneak peek into upcoming books. Great finds! Orphan Number Eight caught my eye. Happy reading!